Has anyone tried this place? I found a review of it in Metromix that really didn't turn my head, any comparison to The Braxton in Oak Brook? Someone suggested this place but no one we know has tried. Personally, I like this restaurant space, which used to be Highland Grill and (years ago) a place called James Tavern that I went to with my parents. Was there a couple of years ago. Liked it. I think the Catch 35 comparison is a good one. But the decor (while still "upscale") is friendlier, while the food may even be a notch better. It didn't blow me away to the point that I would drive out there from the city just to go to dinner, but if I were anywhere within a 5 mile radius of the place, I would go there again. Ron A. wrote: Personally, I like this restaurant space, which used to be Highland Grill and (years ago) a place called James Tavern that I went to with my parents. And before it was James Tavern, the restaurant on that spot was Sage's (West? -- owned by the same guy from downtown) -- I used to go there for lunch when I taught at George Williams College right down the street. I'm bumping this older topic, which is the only one specifically dedicated to Parkers'. I had eaten at Parkers' numerous times over the years, and always enjoyed it. Their seafood has consistently been fresh and their preparations delicious. However, I haven't been there in at least a couple of years. I just noticed several changes there, and I'd welcome feedback from anyone who has been there recently. First, they changed their name from Parkers' Ocean Grill to Parkers' Restaurant & Bar. (I had thought the apostrophe was before the "s" but apparently it's after it, at least on their website.) They also have a new website address, parkersamerican.com. They still have the same ownership (Select Restaurants) and they say they are still offering many of the same recipes as previously. The menu still has a seafood focus while also offering meat and vegetarian items, as well as a new addition, Neapolitan-style pizza. Second, the big news is that last year they completed the certification for their Neopolitan pizza. There is an organization in Naples, the Associazione Verace Pizza Napoletana, which certifies restaurants worldwide for authentic Neopolitan pizza; the certification process is extensive and extends to recipes, ingredients, cooking equipment, etc. They have certified fewer than 40 restaurants in the United States, and Parkers' joins Spacca Napoli as the only two such restaurants in Illinois. I'd like to go back there again some time soon! But in the meantime, I'd love to hear from anyone who has been there recently, about how they've enjoyed it, whether it has changed, how the pizza is, etc. I went there last summer for lunch during OB restaurant week when they were offering a three course prix fixe for lunch and dinner. I recall that everything was well-prepared and presented well. Service was also excellent. nsxtasy wrote: Second, the big news is that last year they completed the certification for their Neopolitan pizza. There is an organization in Naples, the Associazione Verace Pizza Napoletana, which certifies restaurants worldwide for authentic Neopolitan pizza; the certification process is extensive and extends to recipes, ingredients, cooking equipment, etc. They have certified fewer than 40 restaurants in the United States, and Parkers' joins Spacca Napoli as the only two such restaurants in Illinois. With the addition of Forno Rosso Pizzeria Napoletana there are now 3 restaurants in IL certified by Associazione Verace Pizza Napoletana. 8 octopi were served w/this starter, quite tasty. We then split a margherita pizza. 1st thing I noticed was that that center was not very mushy like the pizza I had recently in Naples Italy as well as that at Forno Rosso. The crust could have used a bit more char. The cheese didn't seem like it was buffala di mozzerlla but I asked the waiter to verify & she went back in kitchen to make sure that it indeed was buffala di mozzerlla, not cow's mozzarella. The sauce was terrific, very bright, in fact best sauce out of the Neapolitan pizzas I've had. A manager stopped by and asked how we liked things, I mentioned the non-mush texture of the pizza center. He went onto explain that many just don't understand what Neapolitan pizza is, in fact just the previous evening he got an earful from a couple who had heard how good the pizza was at Parkers' but this couple was disappointed with the texture of their pizza, they felt it was undercooked. So I get the feeling that Parkers' is not charring the pizza as much as they were taught & letting it cooked slightly longer to firm up the crust so that they don't get the complaints, this might explain why I questioned the cheese consistency. All this said, I still very much enjoyed the pizza & look forward to trying others varieties as well as other items at Parkers'. One item in particular is the Manila clam chowder w/hint of cream. Sweet Willie wrote: A manager stopped by and asked how we liked things, I mentioned the non-mush texture of the pizza center. He went onto explain that many just don't understand what Neapolitan pizza is, in fact just the previous evening he got an earful from a couple who had heard how good the pizza was at Parkers' but this couple was disappointed with the texture of their pizza, they felt it was undercooked. So I get the feeling that Parkers' is not charring the pizza as much as they were taught & letting it cooked slightly longer to firm up the crust so that they don't get the complaints, this might explain why I questioned the cheese consistency. Your theory is probably correct. When I first had a Neapolitan pizza, I was put off by the mushy center, and thought it was improperly cooked. I now know that is the way Napoli style pizzas are, and have grown to appreciate the standard. The mushiness in the center is a result of the flash cooking technique and not from moisture in the ingredients. Personally, I prefer a crispier pie, but that would not be a "true" Neapolitan pizza. Parker's has been strangely ignored, but it is all the way past Elmhurst. nsxtasy, good find; Sweet Willie, this place definitely deserves a bump. If we go shopping in the Western Suburbs (god forbid), this is where we'll eat. Must be an interesting story there. When I had a client in DG, I used to end up at Parker's fairly often. It is owned by the parent company of the Winberie's chain (there is one in Oak park, one in Buffalo Grove and there used to be one in Evanston). As I recall, Parker's was better than one might expect from the land of the endless strip mall, and the space itself was very pleasant. I would really like to see what they do with their pizza oven. Maybe you can order a pizza that is not modified for west suburban tastes. Winberie's, never had anything good there. Which makes Parker's an even more pleasing anomaly. Must go. David Hammond wrote: If we go shopping in the Western Suburbs (god forbid), this is where we'll eat. d4v3 wrote: As I recall, Parker's was better than one might expect from the land of the endless strip mall, and the space itself was very pleasant. d4v3 wrote: I would really like to see what they do with their pizza oven. Maybe you can order a pizza that is not modified for west suburban tastes. I would say this should be an easy request. Both our waitress & the mgr were quite eager to please and wanted to make sure I was pleased with our food. I've been going to Parkers' regularly since the above posts, and it continues to excel. I generally go for their seafood, but it's great for Neapolitan pizza as well. d4v3 wrote: When I had a client in DG, I used to end up at Parker's fairly often. It is owned by the parent company of the Winberie's chain (there is one in Oak park, one in Buffalo Grove and there used to be one in Evanston). As I recall, Parker's was better than one might expect from the land of the endless strip mall, and the space itself was very pleasant. I would really like to see what they do with their pizza oven. Maybe you can order a pizza that is not modified for west suburban tastes. It amazes me that people who would go ballistic if someone dared uttered a ethnic or sexual stereotype, feel real confortable with perpetuating the same old tired urban vs. suburban claptrap. There is more to life in the western suburbs than Applebees and strip malls. nsxtasy wrote: I just noticed several changes there, and I'd welcome feedback from anyone who has been there recently. I was there for dinner Saturday night and it was absolutely awesome. One dish was the best thing I've eaten in months. They have swordfish on the menu and the preparation changes (the menu says "chef's preparation"). 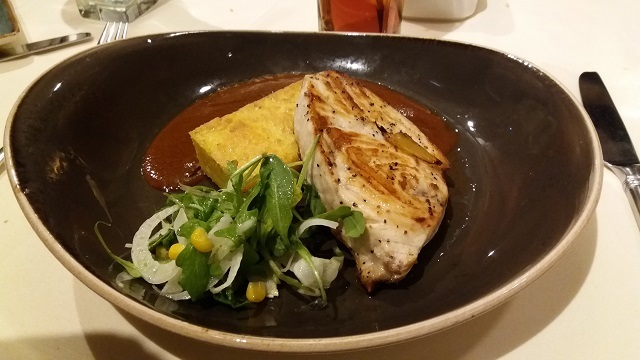 This time it was perfectly grilled, served with a tasty polenta cake, and the most amazing mole sauce - as thick, rich, complex, spicy, and delicious as you'll find at any Mexican restaurant. 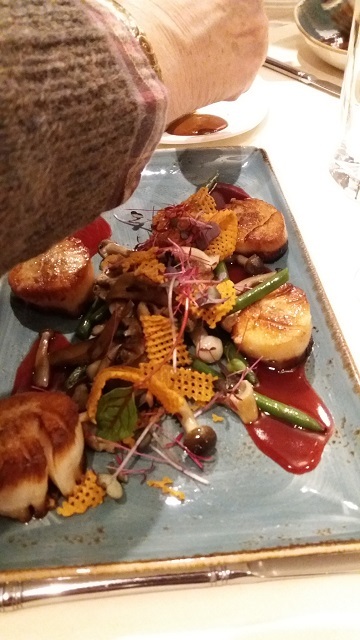 Equally noteworthy was their preparation of pan-roasted sea scallops, accompanied by a spicy cranberry coulis. My general bias is to try restaurants I've never tried before. As a result, there aren't many restaurants (at least, that are some distance from home) to which I keep returning over and over. Parker's is one of the few. It's that good. I love it! Must re try. Been there over the years. But somehow its never drawn me to be a frequent diner.